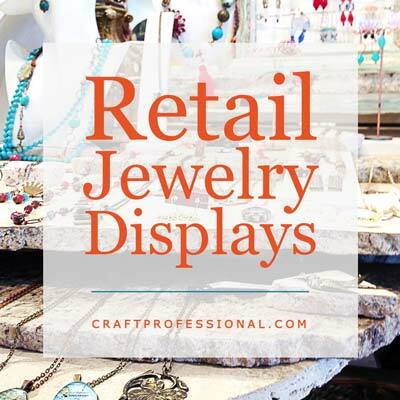 Unique jewelry displays make smart use of color to set the tone. 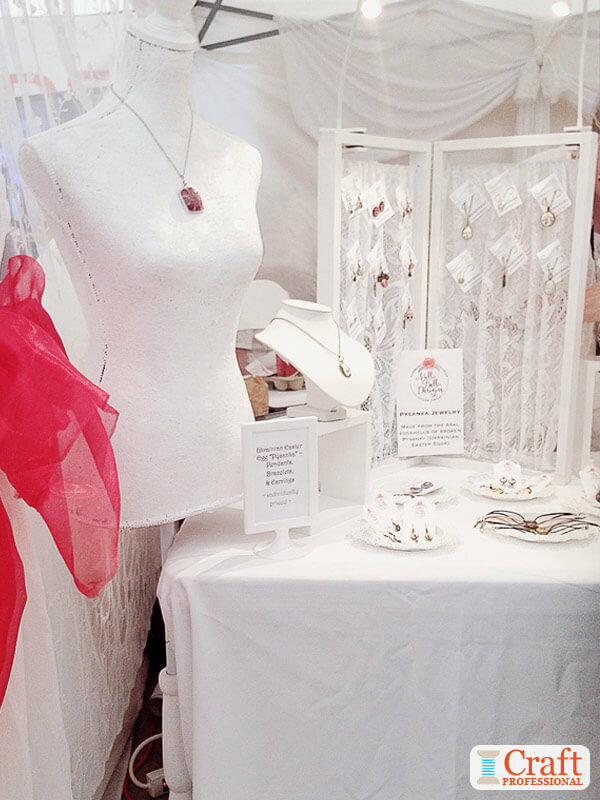 Compare the different feel created by an all white handmade jewelry booth vs. an all black jewelry display. Both approaches are effective and make a strong statement, but they create very different looks. 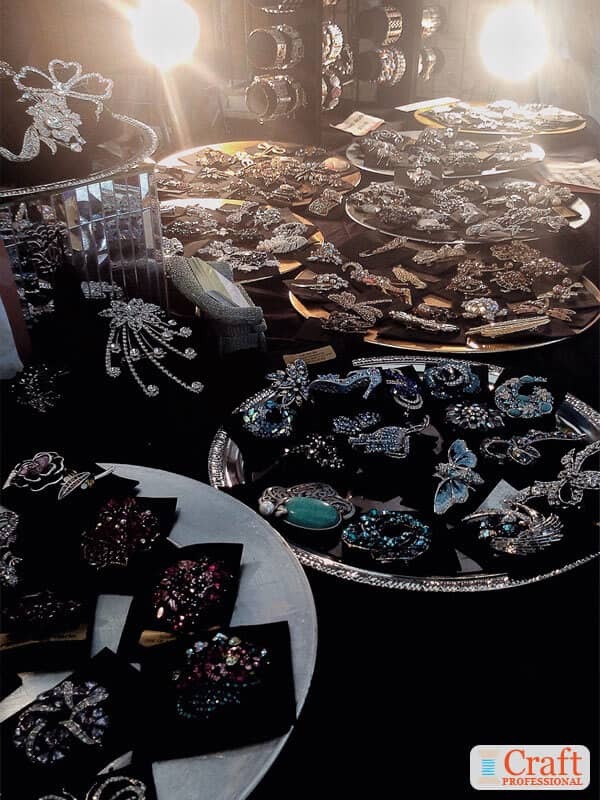 We'll start with photos of a truly unique jewelry display that's all-black. 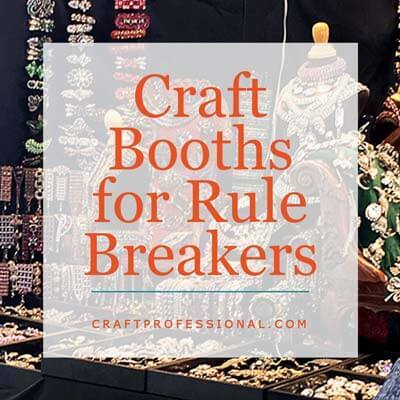 As you check out the photos, you'll notice how much this booth breaks so many of the rules you've read about craft booth design. It doesn't just bend the rules. It shatters them! Yet, it works. 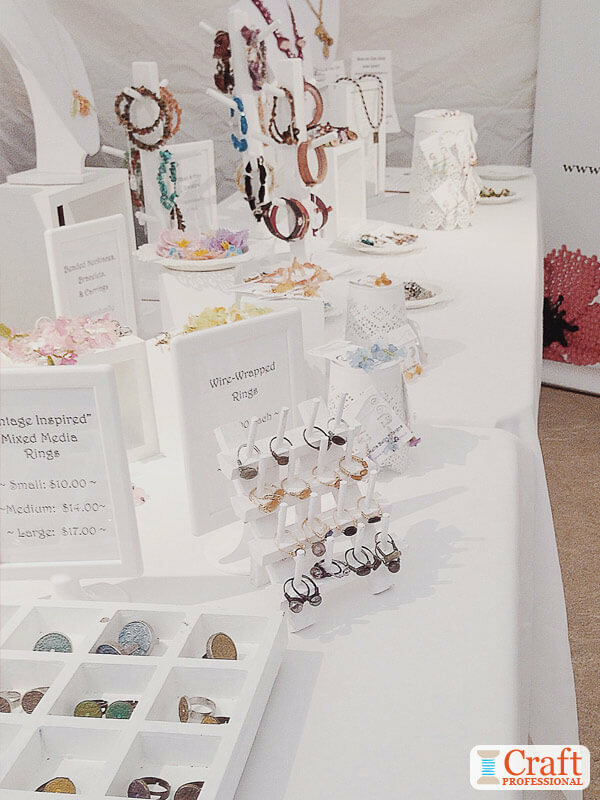 The first thing you notice when you come upon this booth is that it's jam-packed with handmade jewelry. 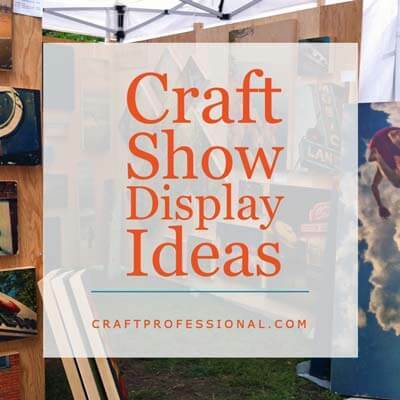 Packing a booth with handmade items goes against everything many of us have learned about creating an effective display. Normally, you avoid putting out too much product, because you don't want to detract from the specialness of each piece. However, this profusion of jewelry works. Although there are plenty of pieces, each one is displayed with care. The display sparkles, draws the eye, and stands out amid all of the other booths. Here's a full view of the booth. Notice it is really, truly, all black. There are no half measures in the color selection. Everything from the black canopy, to the table covers, the drapes, and most of the display pieces are black. 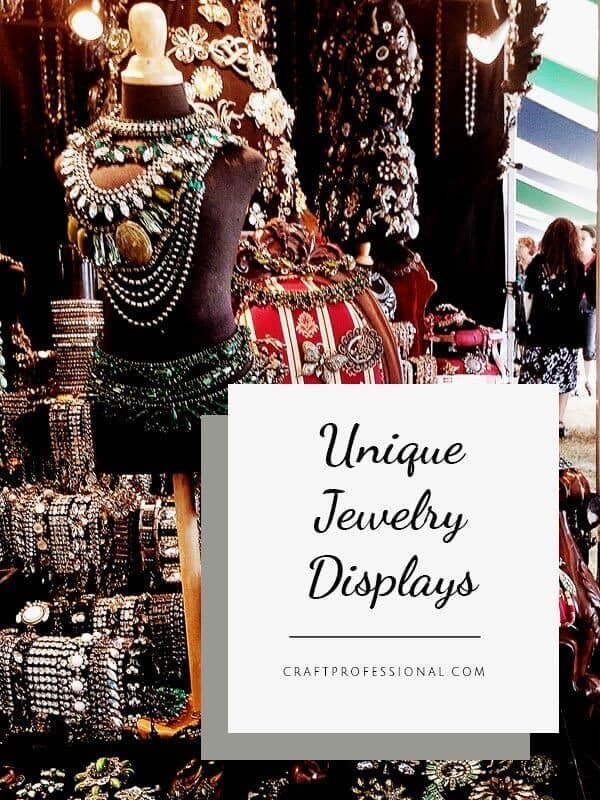 The color is clearly selected with the intention of creating a fearless, unique jewelry display that makes a dramatic statement and stands out from other displays. Black craft tents especially are usually not recommended because they darken your space. 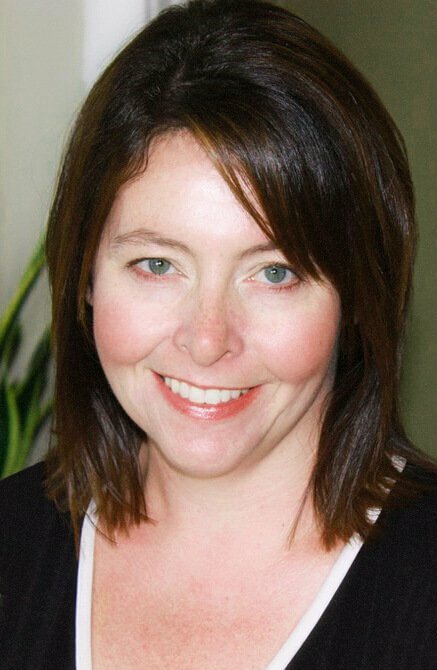 But here's an example of a craft professional who breaks the rules with an excellent outcome. 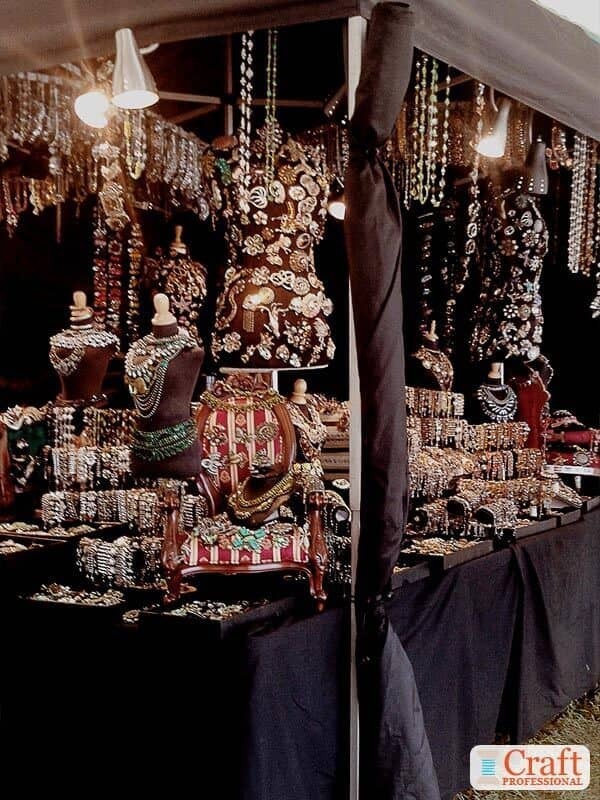 Here's another jewelry booth using black as a backdrop to show off jewelry. The silver tray add a little sparkle while keeping the look neutral and maintaining the dramatic effect of the black background. 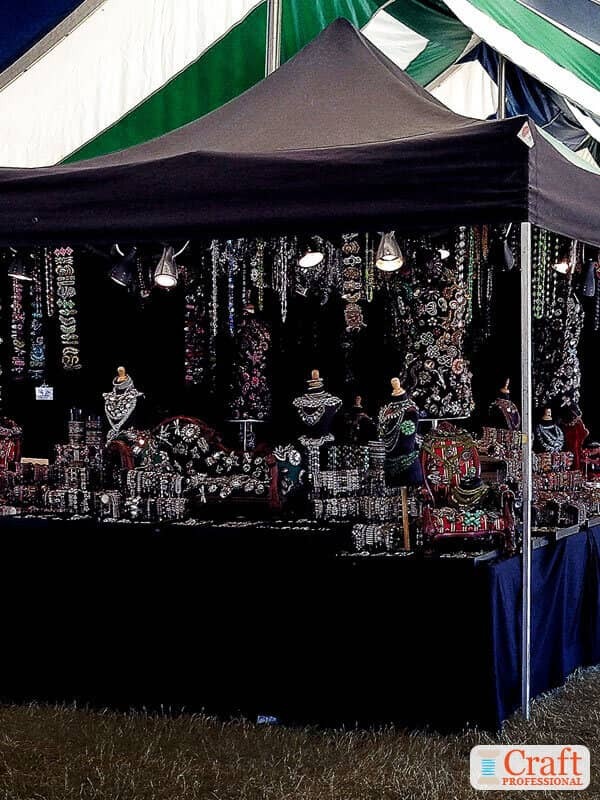 If you're going to have an all black jewelry display complete with a black craft tent, you'd better have a lot of great lighting. An all black display demands loads of great lighting. 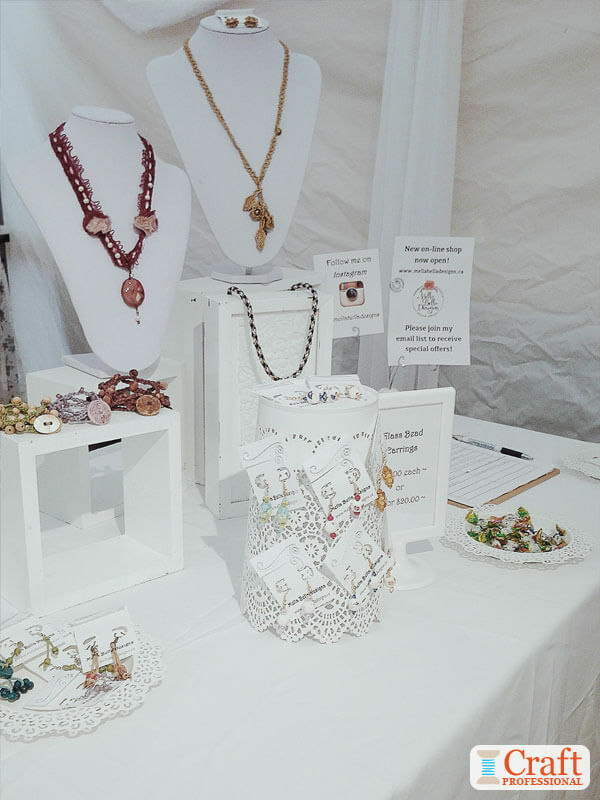 The overhead lights throughout this booth brighten up the space and make the jewelry sparkle against the black backdrop. 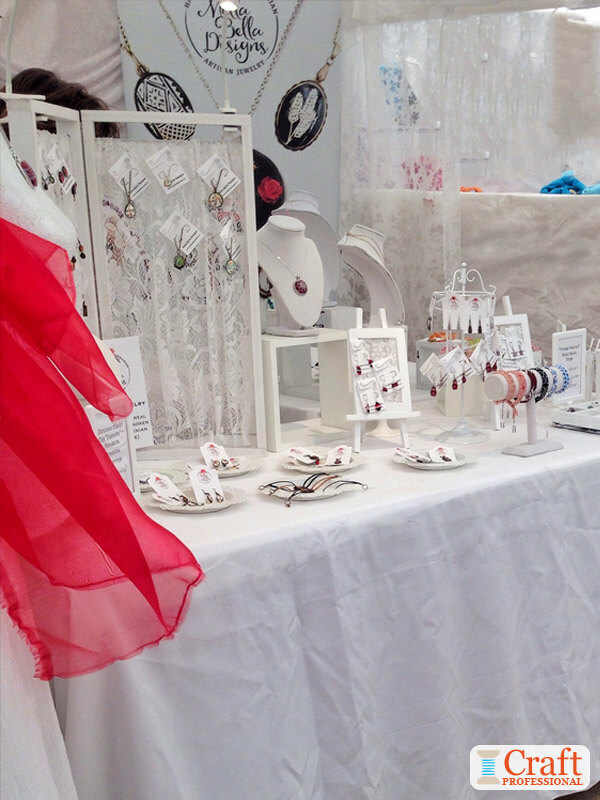 Here's the opposite look for a handmade jewelry display - an all white booth. 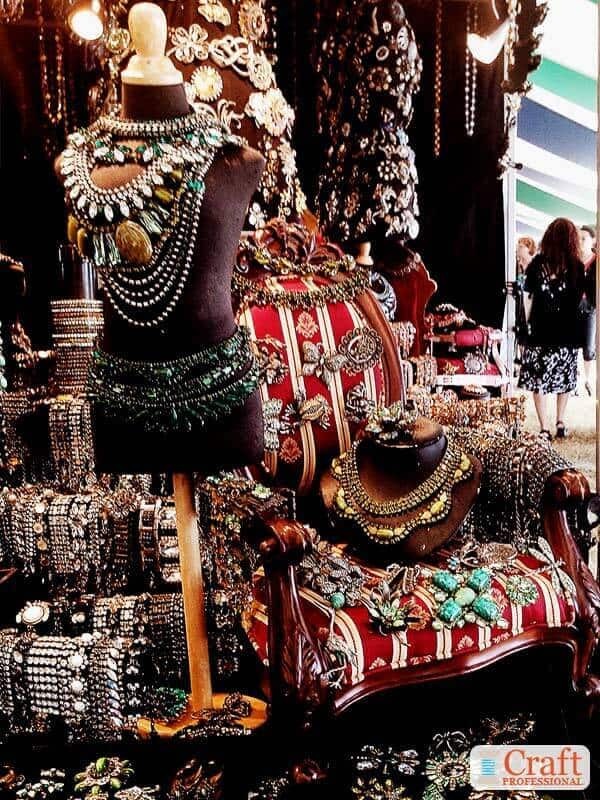 You'll tend to see this approach to displaying jewelry more frequently than an all-black booth. It's less of a risk, and less dramatic than an all-black booth, but it's easier to get the look right, and it creates a beautiful, elegant effect that puts the focus on your jewelry. Using all white throughout the majority of your display provides a unique opportunity to use a single pop of color in your booth. Notice in the photos below, there's just a bit of red use in this display. It's enough to draw the eye without losing the effect of the otherwise all white display. A single swath of a strong color can go a long way to create interest in an otherwise all white booth. Notice, too, at the top of the photos, the lighting used in the display. Just because your booth is white, doesn't mean you can ignore lighting. The lights here ensure the jewelry in the booth sparkles. 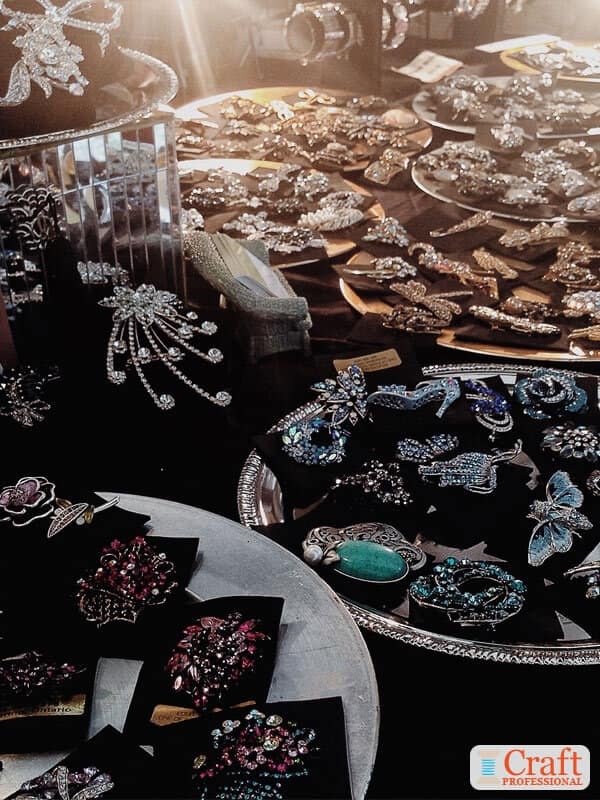 Although these unique jewelry displays are vastly different, one thing they have in common is that they follow through with their themes to the full extent possible. The black booth is truly all black. Try to imagine that display with a white tent, or white sidewalls. It wouldn't have the same effect. The same is true for the white booth. If you replaced a few of the display busts with black or wood busts, you'd end up with a completely different feel in the booth - not necessarily wrong, but different. The complete commitment to white allows that single pop of color to be dramatic and effective. Also, the themes don't distract customers from the jewelry. Instead, they unite the look, allowing customers to focus on the jewelry once they are up close. You should be wary of any themed booth that might cause customers to admire your display more than your product. If you're going for a specific look in your booth, go all in to get the full effect. Hundreds of craft booth photos.